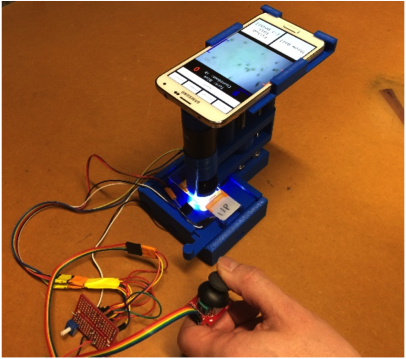 We present a low-cost biotic game design kit for formal and informalSTEAM education that incorporates microbial organisms into an interactive gaming experience: A 3D-printable microscope containing four LEDs controlled by a joystick enable human players to provide directional light stimuli to the motile single-celled organism Euglena gracilis. These cellular behaviors are displayed on the integrated smart phone. Real time cell-tracking couples these cells into interactive biotic video game play, i.e., the human player steers Euglena to play soccer with virtual balls and goals. The player’s learning curve in mastering this fun game is intrinsically coupled to develop a deeper knowledge about Euglena’s cell morphology and phototactic behavior. This kit is dual educational – via construction and via play; its low cost and open soft- and hardware should enable easy, wide adoption and further development.